1. Chicks are not growing. Not growing, cannibalism, crooked legs. These all stem back to nutritional deficiency. If you are not following our feed guidelines then you may have these problems. Provide adequate feeder space, do not scrimp on feed or supplement. Provide clean, course wheat straw or soft wood shavings, if any other bedding has been used give the birds approx 1 tablespoon of cooking molasses per 1 gallon of water ( turn the water light brownish) for 1 day only. This will unplug the bird’s gizzard as it’s like a natural laxative. Prevent overheating, overcrowding or any stress. Cannibalism – Caused by stress of some sort. 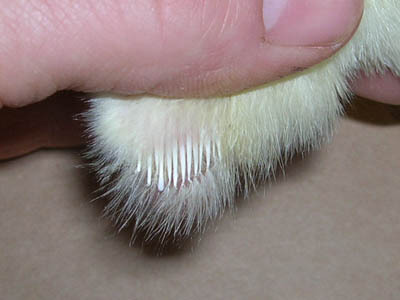 Change of weather can cause poultry to start to pick. If picking begins in the first 4 weeks (still on chick starter) it will probably be because of overheating, overcrowding, drafty building or bright lights. If this occurs make the chicks as comfortable as possible. Make the room very dark, add more feeders and add super booster or terramycin to the water. Over 4 weeks – After you have switched to your own grains and they begin to pick it will be a nutritional deficiency. Grain lacks several essential vitamins and minerals that is why we recommend poultry grower supplement. 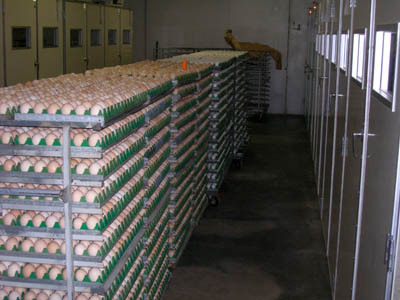 Laying hens – In laying hens the most common is vent picking or eating the eggs. Make sure you follow our nutritional guidelines and add a stress pack to the water. 3. Flock is sickly looking. Colds or CRD – Droopy wings, loose droppings, wheezing, or sickly looking. Your birds have probably caught a cold. They need medicine immediately so add some Terramycin to the water. If birds are still brooding take a temperature of coldest point your birds have access to. If there is higher than normal mortality phone our head office someone will try to help you. After season leave a message we always try to help for your success is our success. This problem will most always happen in the Cornish Cross Giant. Studies show that flocks raised to nine weeks of age will almost always have 3% of the birds with leg problems. Birds raised to heavier weights will likely have a higher percentage, perhaps 5%. So as small producers we deal with more leg problems. The best prevention is to follow our guidelines to reduce the number of problems. For example if you turn the lights off (not the heat source) then the birds cannot eat 24 hours a day. Spread the feeders and waterers apart so they have to walk to each. Have a run for them outside so they can exercise. Make sure you eviscerate them on time. You can start at 10 weeks depending on what size you require. 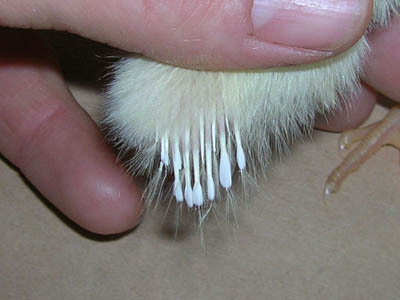 Coccidiosis is common in small flocks. This is a parasite that is found in the litter. It is especially common in a wet, cool spring or wet litter in your barn. You will probably notice bloody droppings. Prevention is by use of medicated chick starters and supplements. One of the treatments is by Amproyl, sold at Berg’s Stores and Agents. If coccidiosis goes untreated it will destroy the whole flock. Once you have a cocci break you must use Amproyl or another coccistat to control it. E Coli is caused by unclean conditions. If a flock is being rotated year by year with no clean up practices you will probably get E Coli. It will be best detected by a poultry specialist through tests. Ascites is a condition not a disease. It is a distended abdomen that may be filled with fluid. There is often muscle congestion and enlarged heart. One or both lungs may be congested and watery. It is caused from lack of oxygen, phosphorus, vitamin E and selenium deficiencies and high levels of salt in water or diet. Prevention again would be by following our guidelines to managing your poultry. Trouble shooting your flock or Poultry is the best Prevention of any of the above. Following proper procedures when raising the birds will provide you with a finished healthy Farm Grown Bird. Poultry grower supplements will only add to your productivity and enhance your flock. Supplement contains the vitamins and minerals that grain will not provide. Cornish Giants – Care-Management-Nutritional Guidelines. must remain. Reason being the coccidosis medicine and litter work together to vaccinate chicks against coccidosis. 3. Floor space– the first 3 weeks 1/2 square foot per chick. Until 8 weeks 1 square foot per chick. After that you will need 2 square feet per bird. 1000 Cornish Giants = 2000 square foot building. (Do not include the run outside in the square foot amount). 4. Water- To start baby chicks use a vitamin pack in water for 3-5 days. Use 3-1 gallon founts to start 100 baby chicks. Allow 3-8 gallon waterers for 100 birds or if automatic waterers are used you will need 2 per 100 birds. 5. Feed- To start baby chicks you will need small trough feeders, or use egg flats or box tops for the first week. You will then need 4-50 lb. feeders per 100 birds. This will give the birds adequate amount of space to feed. 6. Lighting- For the first 24 hours allow continuous light. After this light should be reduced to 8 hours per day. 7. Ventilation- Ventilation supplies oxygen the birds need to maintain good health and grow properly. Air inlets and fans are needed to provide fresh air and remove carbon monoxide, carbon dioxide and ammonia. provide adequate air movement to maintain comfort and good litter conditions. 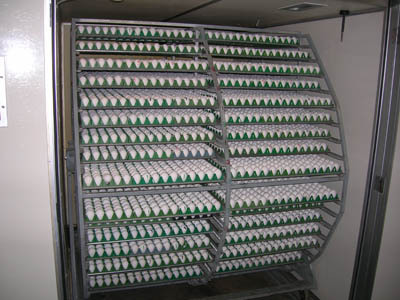 Eggs in trays and ready to go into incubators in the morning – Eggs in incubators ready to start. NOTE: Sorry we cannot mail any started birds so please order day olds if you wish to receive them via mail. Please contact us for mailing or air costs.